Microsoft made a point to focus on the Xbox One’s new power states during its introduction. Remember that when the Xbox 360 was introduced, power gating wasn’t present in any shipping CPU or GPU architectures. The Xbox One (and likely the PlayStation 4) can power gate unused CPU cores. AMD’s GCN architecture supports power gating, so I’d assume that parts of the GPU can be power gated as well. Dynamic frequency/voltage scaling is also supported. The result is that we should see a good dynamic range of power consumption on the Xbox One, compared to the Xbox 360’s more on/off nature. AMD’s Jaguar is quite power efficient, capable of low single digit idle power so I would expect far lower idle power consumption than even the current slim Xbox 360 (50W would be easy, 20W should be doable for truly idle). Under heavy gaming load I’d expect to see higher power consumption than the current Xbox 360, but still less than the original 2005 Xbox 360. Compared to the PlayStation 4, Microsoft should have the cooler running console under load. Fewer GPU ALUs and lower power memory don’t help with performance but do at least offer one side benefit. The Xbox One is powered by two independent OSes running on a custom version of Microsoft’s Hyper-V hypervisor. Microsoft made the hypervisor very lightweight, and created hard partitions of system resources for the two OSes that run on top of it: the Xbox OS and the Windows kernel. 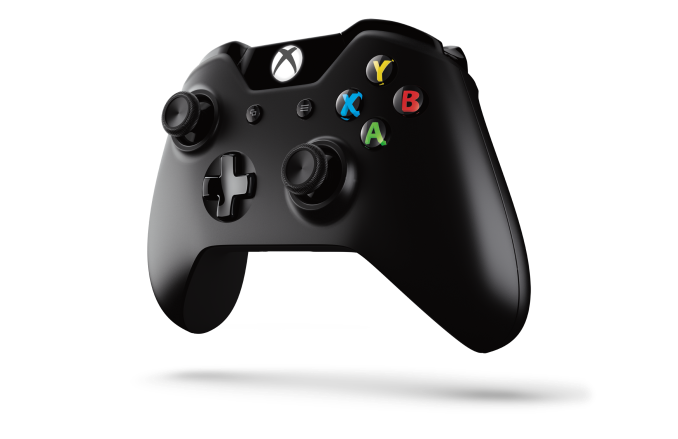 The Xbox OS is used to play games, while the Windows kernel effectively handles all apps (as well as things like some of the processing for Kinect inputs). Since both OSes are just VMs on the same hypervisor, they are both running simultaneously all of the time, enabling seamless switching between the two. With much faster hardware and more cores (8 vs 3 in the Xbox 360), Microsoft can likely dedicate Xbox 360-like CPU performance to the Windows kernel while running games without any negative performance impact. Transitioning in/out of a game should be very quick thanks to this architecture. It makes a ton of sense. Similarly, you can now multitask with apps. Microsoft enabled Windows 8-like multitasking where you can snap an app to one side of the screen while watching a video or playing a game on the other. The hard partitioning of resources would be nice to know more about. The easiest thing would be to dedicate a Jaguar compute module to each OS, but that might end up being overkill for the Windows kernel and insufficient for some gaming workloads. I suspect ~1GB of system memory ends up being carved off for Windows. All Xbox One consoles will ship with a bundled Kinect sensor. Game console accessories generally don’t do all that well if they’re optional. Kinect seemed to be the exception to the rule, but Microsoft is very focused on Kinect being a part of the Xbox going forward so integration here makes sense. The One’s introduction was done entirely via Kinect enabled voice and gesture controls. You can even wake the Xbox One from a sleep state using voice (say “Xbox on”), leveraging Kinect and good power gating at the silicon level. You can use large two-hand pinch and stretch gestures to quickly move in and out of the One’s home screen. The Kinect sensor itself is one of 5 semi-custom silicon elements in the Xbox One - the other four are: SoC, PCH, Kinect IO chip and Blu-ray DSP (read: the end of optical drive based exploits). In the One’s Kinect implementation Microsoft goes from a 640 x 480 sensor to 1920 x 1080 (I’m assuming 1080p for the depth stream as well). The camera’s field of view was increased by 60%, allowing support for up to 6 recognized skeletons (compared to 2 in the original Kinect). Taller users can now get closer to the camera thanks to the larger FOV, similarly the sensor can be used in smaller rooms. Thanks to Kinect's higher resolution and more sensitive camera, the console should be able to identify who is gaming and automatically pair the user to the controller. The Xbox One features a HDMI input for cable TV passthrough (from a cable box or some other tuner with HDMI out). Content passed through can be viewed with overlays from the Xbox or just as you would if the Xbox wasn’t present. 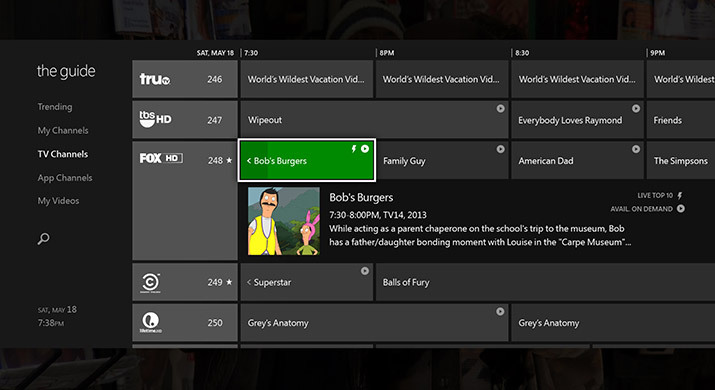 Microsoft built its own electronic program guide that allows you to tune channels by name, not just channel number (e.g. say “Watch HBO”). The implementation looks pretty slick, and should hopefully keep you from having to switch inputs on your TV - the Xbox One should drive everything. 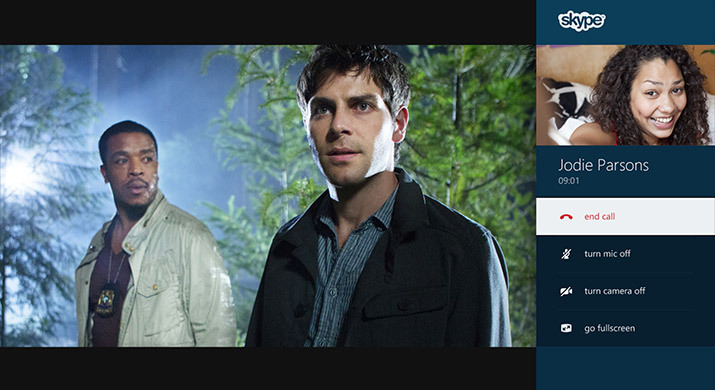 Microsoft appears to be doing its best to merge legacy TV with the new world of buying/renting content via Xbox Live. It’s a smart move. 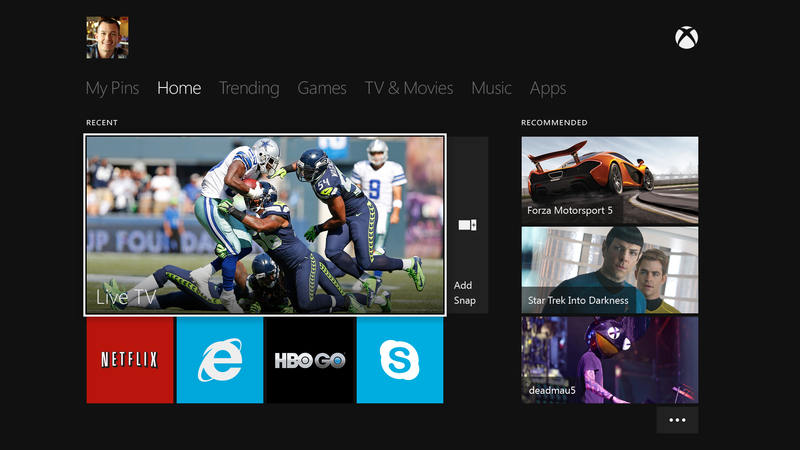 One area where Microsoft is being a bit more aggressive is in its work with the NFL. Microsoft demonstrated fantasy football integration while watching NFL passed through to the Xbox One.